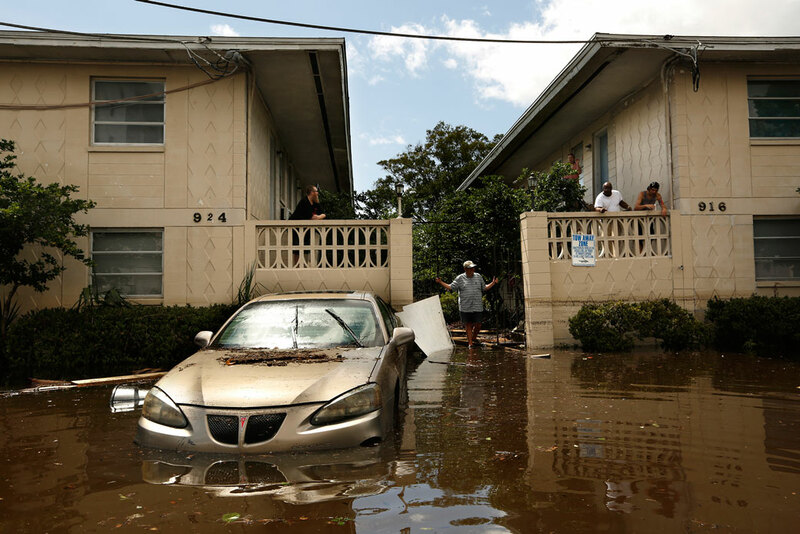 A car sits in floodwater on September 12, 2017, after Hurricane Irma hit the San Marco neighborhood in Jacksonville, Florida. Florida state leaders have an opportunity to support investments in innovative and future-ready transportation, energy systems, and flood protections so that communities can better withstand sea level rise and extreme weather threats. State leaders will increasingly be confronted with the need to support future-ready communities and infrastructure that is designed to withstand 21st century threats while improving families’ economic stability and protecting the air, water, and natural areas that voters deeply value.4 In order to alleviate the pressures of rapid population growth and more extreme weather, state leaders need a comprehensive and sustainable long-term strategy to close the state’s future-ready infrastructure investment gap. To safeguard Floridians against the impacts of sea level rise and extreme weather, the Center for American Progress and the CLEO Institute recommend that state leaders create a “Florida Future Fund.”5 This state fund would use a blend of public and private investment—as well as financing products—to support innovative transportation and energy infrastructure projects and flood protections in areas that need them the most. The fund would provide low-interest or interest-free loans, loan guarantees, and other financing products. It would also leverage philanthropic and private capital in order to expand investment in future-ready infrastructure, including community solar projects, energy efficiency improvements, regional transportation services, public transit upgrades, electric vehicle charging stations, parks, and other community flood protections. These investments would improve Florida’s resilience and quality of life, creating good jobs; lowering energy bills; reducing costly flood damage to homes and businesses; and efficiently connecting people to employment opportunities, child care, schools, and other critical community services. In sum, the Florida Future Fund offers state leaders a forward-thinking and equitable approach to modernizing the critical infrastructure needed to support the state’s economy, and help communities prepare for the future as extreme weather risks increase and the sea rises. Floridians also face climbing temperatures and extreme heat waves, making it impossible to depend solely on sea breezes for cooling.15 This means higher costs for homes and businesses that will now have to install and more frequently use air conditioning systems. Sea level rise and extreme weather threats increase the strain on Florida’s aging energy, transportation, and water systems as well as on other infrastructure that supports the state’s economy and the daily lives of residents.16 In the face of a changing climate and growing population, without a massive modernization investment in Florida’s infrastructure, state residents’ prosperity and quality of life will suffer. Despite the state’s strong gross domestic product and growing economy, Florida has the fifth-highest income inequality among states in the nation and financial instability is commonplace among Florida households.17 More than 57 percent of Florida residents do not have money set aside in case of an emergency, which ranks them last in the nation for emergency savings.18 This lack of an emergency cushion means that in the wake of an extreme weather disaster, nearly six out of 10 Floridians may not be able to pay for food, critical health care services, child care, emergency housing, or home repairs without going into debt or falling deeper into poverty. Without a massive modernization investment in Florida’s infrastructure, state residents’ prosperity and quality of life will suffer. The risks of sea level rise and more intense extreme weather in Florida are exacerbated by aging infrastructure, rapid population growth, and pervasive economic instability. As such, these challenges demand an effective and long-term response from state and local leaders. Currently, state leaders are not investing in deployable technologies and forward-looking solutions to improve Florida’s infrastructure at the pace and level needed to address the state’s challenges. For example, clean energy and energy efficiency projects can improve energy security and indoor living conditions; transportation upgrades can enhance mobility and reduce local pollution; and tree, wetland, and coastal restoration projects can reduce flooding. Yet public and private investments are often directed toward other priorities rather than cleaner and more innovative projects that reduce climate change threats. As a result, the state has a future-ready infrastructure funding gap, particularly in low-income areas, communities of color, and tribal communities, all of which are already placed at risk and at a severe disadvantage by discriminatory and neglectful past and present public policies and planning decisions. To address the above opportunities and challenges, state leaders must move quickly to develop a forward-thinking, equitable, and sustainable infrastructure investment strategy that accelerates the clean energy transition and prepares both communities and the economy for long-term extreme weather, sea level rise, and population growth trends. In 2017, the American Society of Civil Engineers gave Florida infrastructure a C grade, and the condition of Florida’s transit system ranks 19th out of all states—just behind Georgia.57 State leaders’ current approach may be enough to maintain a passing grade for Florida infrastructure, but it places too much dependency on direct appropriations and the whims of state House politics. For this reason, the state is at risk of continually falling behind in the years to come. Instead of relying on temporary fixes, Florida leaders must use a long-term strategy to jumpstart future-ready infrastructure solutions that will support a strong, clean, and inclusive economy; improve neighborhood livability; and protect the air, water, and natural areas that voters deeply value.58 The majority of Floridians demand a smarter and more forward-thinking response to the state’s pressing infrastructure, sea level rise, and extreme weather challenges.59 Florida policymakers have a responsibility to meet this demand. By building future-ready energy systems, transportation infrastructure, and neighborhood flood protections that can better withstand climate change threats and the demands of a growing population, state leaders can strengthen economic security, improve equity, and protect statewide public health and safety. Upgrading aging infrastructure that puts communities and local economies at risk in a changing climate must be a top priority for Florida. By creating a Florida Future Fund, state leaders would open up new and innovative financing pathways to modernize Florida’s infrastructure while reducing flooding and extreme weather threats. Updating municipal planning and development codes for flood reduction. The Florida Future Fund would prioritize project investments in communities that need it the most, including low-income areas, communities of color, and tribes. To support local job creation, the fund could pair investments made in these communities with job training programs. As shown in Table 1 below, the Florida Future Fund would support ready-to-deploy solutions that embrace best practices as well as more innovative project designs that would reduce future threats. Florida could offset 47 percent of its total electricity consumption through rooftop solar alone. According to an analysis of publicly available information, after Hurricane Sandy, $3.2 billion in federal funds for rebuilding infrastructure and communities created 81,000 jobs in New York City.68 Similarly, the Florida Future Fund would invest in infrastructure that would create jobs and be designed to withstand future sea level rise and extreme weather threats. The Florida Future Fund would also help Floridians lower future flooding and extreme weather damages and costs. Risk management experts estimate that for every $1 invested in building resilient communities and infrastructure, $6 are saved in future costs—including economic disruptions, property damage, public health crises, and deaths caused by extreme weather disasters.69 Based on this estimate, if state leaders invested $283 million across the state in infrastructure to prepare areas vulnerable to sea level rise and extreme weather, Florida taxpayers could save nearly the same amount that they paid to repair damage from Hurricane Irma—approximately $1.7 billion. The economic benefits of Florida Future Fund investments could be distributed across urban and rural areas by expanding economic opportunities in the communities where projects are located; by reducing the costs of future flooding and disaster damage; and by helping business owners and residents save money on their energy bills. For example, the fund could support flood protections and future-ready public transit projects to help safeguard city centers from future threats while improving economic mobility and air quality. In addition, by reducing certain flood risks, the fund could bolster the state’s agricultural, outdoor recreation, and tourism economies, on which rural and urban residents alike depend. To design a Florida Future Fund that will drive smart investments into future-ready projects, state leaders can draw lessons from similar funds in other states. For example, infrastructure funds in states such as New York, Michigan, and California have used innovative capitalization and finance options, sound and equitable project criteria, and strong community engagement and oversight processes. Taken together, they can inform Florida state leaders on how to design a Florida Future Fund. These and other fund design options are described below. A Florida Future Fund could be established either by the governor through executive action or through legislative action, as New York and Connecticut have done, respectively, to create their green banks.71 A fund could also be created as a program within an existing agency or organization. For example, the Florida State Infrastructure Bank was established as a program of the Florida Department of Transportation.72 State green banks have also been created as programs within the state public utility commissions, as stand-alone state agencies, and as private and independent nonprofit corporations with state oversight. 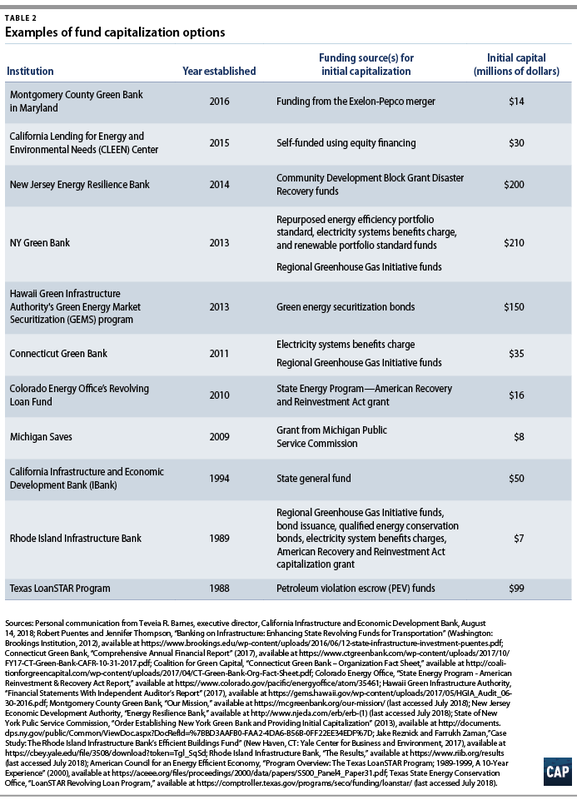 Green banks that are established as programs and state agencies have experienced a mix of successes and challenges. For example, housing a financial entity within state government can increase the risk that funds will be diverted to cover other government expenses, and it creates bureaucratic hurdles that slow the flow of capital to private and public project developers. To avoid funding delays or diversions, Nevada lawmakers are considering making the state’s green bank, established in 2017, a private nonprofit corporation.73 The independent nonprofit model is appealing to state leaders because it would efficiently channel investments to support Nevada’s budding clean energy market, creating new jobs and improving public health and safety, all while reducing air and carbon pollution. Ideally, Florida policymakers would establish a Florida Future Fund as an independent nonprofit entity with strong rules that would protect the fund’s resources from being diverted for other purposes. These protections could be included in the executive action or legislation that establishes the fund, or they could be secured later through a ballot initiative. For example, in 2014, voters approved a constitutional amendment to the Land Acquisition Trust Fund, which ensured that, going forward, the same amount of documentary stamps tax revenue used to pay off Florida Forever’s original capitalization bonds would be devoted to the program.74 Without such protective measures in place, Florida Future Fund revenue could be cut or diverted to other initiatives, which would slow progress toward bringing future-ready infrastructure and neighborhood improvements to Floridians. By creating a transparent project review process with equitable criteria, fair metrics, and balanced Florida Future Fund leadership, state leaders will ensure that the fund invests in projects that will improve the quality of life and future readiness of all Floridians. At its inception, the Florida Future Fund should be capitalized with a combination of different public funding streams, thereby allowing Florida leaders to tap into a flexible and diversified source of capital to support the future readiness of infrastructure and communities. The scope and growth rate of the Florida Future Fund is dependent on the amount of seed money raised and whether initial funding will be augmented with a continuous revenue stream. Therefore, to launch an effective fund, state leaders would need to determine the right mix of local, state, and federal public resources. They could also structure the Florida Future Fund to help fill the future-ready infrastructure spending gap by leveraging private dollars. Philanthropies, utilities, and investment banks are all potential partners for state leaders to augment public spending for Florida Future Fund capitalization and implementation. Options for Florida leaders to create a blend of public and private dollars are described below, and examples of how various state infrastructure funds were initially capitalized are included in Table 2. State leaders should also consider identifying a constant, dedicated revenue stream to ensure the long-term viability of the Florida Future Fund. The most direct method of public investment in the Florida Future Fund would be appropriations from the state’s annual budgeting process. This method would allow state leaders to take an active role in ensuring that the Florida Future Fund has sufficient resources to address the economic, social, and political realities of the state. However, while direct appropriations would be the simplest way of capitalizing the Florida Future Fund, this approach is susceptible to potential budget shortfalls, changes in the political landscape, and competing funding priorities—especially if the fund is primarily composed of public capital. The systems benefits charge could also be collected on a volumetric basis—based on the amount of electricity a household uses, usually in the form of a charge per kWh. For example, New Hampshire adds a 0.348 cents per kWh systems benefit charge to consumers’ electricity bills, whereas Eversource Energy in Connecticut charges 1.02 cents per kWh and Orange and Rockland Utilities in New York charges 0.587 cents per kWh.85 The volumetric approach is often seen as more equitable than a fixed charge since consumers with the lowest electricity demand pay less to support energy system improvements than high demand users. State policymakers should strongly consider equity and seek public feedback when deciding between a fixed or volumetric-based system benefits charge. Given Florida’s vulnerability to powerful hurricanes, sea level rise, flash flooding, and extreme heat waves, state leaders could invite grants or donations from private foundations to support the Florida Future Fund. Foundation grants offer the Florida Future Fund the opportunity to secure resources that are not subject to the politics surrounding tax revenue, appropriations, or bond issuance. However, grant funding from foundations or donations can be intermittent, so it may not serve as a stable source of financing for the Florida Future Fund over time. Also, state leaders would need to focus on foundations with goals that matched those of the fund. To take advantage of Florida’s clean energy market potential, state leaders could explore meaningful partnerships with electric utilities in an effort to deliver direct and measurable benefits to the state’s electricity consumers. Under these partnerships, utilities could, for example, commit to investing at least 6 percent of revenue in energy efficiency programs—in line with the nation’s top energy-efficient utilities and tripling their current investments in renewable energy generation capacity by 2030 through contributions to the Florida Future Fund.91 These investments would benefit utility customers by lowering electricity bills, mitigating local air and carbon pollution, and improving electricity system reliability. By learning from the experience of successful state green banks and conservation financing initiatives—and by partnering with community development banks—Florida state leaders can design the Florida Future Fund to attract the private capital needed to scale up investments in future-ready infrastructure. After the Connecticut Green Bank was established, every public dollar invested by the bank in clean energy projects drove $6 of private investment. In 2017, Connecticut’s green bank won the prestigious Innovations in American Government award from the Ash Center for Democratic Governance and Innovation at Harvard University.92 The award was in recognition of Connecticut state leaders’ forward-leaning approach of leveraging private dollars to invest in projects that paid dividends back to taxpayers. In the 11 years prior to the creation of the Connecticut Green Bank, the state provided subsidies to rooftop solar customers in the form of rebates in order to help meet the state’s greenhouse gas reduction goals. This approach matched private dollars with public dollars at a rate of 1-to-1.93 After the Connecticut Green Bank was established, every public dollar invested by the bank in clean energy projects drove $6 of private investment, as recorded through fiscal year 2016.94 Although the Connecticut Green Bank began in 2011 with only a $35 million capitalization, it has now leveraged nearly $800 million in private capital to generate small-scale clean energy and transportation system investments of more than a billion dollars.95 As a result, Connecticut’s green bank has created more than 12,000 clean energy jobs within the state and has deployed nearly 200 megawatts of renewable capacity. Connecticut’s green bank success has inspired at least eight other states to launch their own green banks. In addition to learning from successful state green banks and conservation financing models, Florida state leaders could design a Florida Future Fund that would work with community banks to drive investments in future-ready infrastructure that meets community needs. The fund could also work with larger investment banks from Florida’s financial sector or investors outside of Florida to back innovative infrastructure and neighborhood improvement projects that benefit Floridians. Florida leaders could also leverage private investments pooled by other state infrastructure banks, such as the NY Green Bank. New York is in the process of creating a stable clean energy and small-scale transportation infrastructure funding portfolio that will attract $1 billion in investment from banks, pension funds, and other groups. One could argue that, given the large economic potential of renewable energy and the need for energy efficiency solutions in homes and businesses across Florida, private investors in the NY Green Bank could be drawn to invest in Florida’s clean energy market via a Florida Future Fund. Depending on the will of state policymakers, the potential public and private revenue streams described above could support the Florida Future Fund for a set period or indefinitely. By securing continuous revenue streams, the Florida Future Fund would be able to maintain liquid assets and could allocate resources to projects that may take longer to earn a return. Additionally, if designed with a recurring revenue source, the Florida Future Fund could become self-sufficient, enabling it to address critical infrastructure and environmental challenges for years to come. Since each capitalization option can alter the Florida Future Fund’s operations and capabilities, state leaders should consider what combination of funding sources is most suitable for establishing and sustaining a fund that will support 21st century energy and transportation infrastructure as well as the flood protections that Florida needs. Florida leaders should instruct the board of the Florida Future Fund to set project criteria that will channel new and equitable investment in innovative transportation solutions, energy systems, and flood protections, all of which support extreme weather preparedness, economic development, and public health and safety. For example, the New York Green Bank has investment criteria that are designed to more efficiently accelerate clean energy development in the state; these include ensuring that financial transactions happen at market rate, contribute to market growth, and support the state’s greenhouse gas reduction policies.101 Florida could set similar criteria to support a rapid increase in energy efficiency improvements and renewable energy use. Lastly, state leaders should require that between 25 to 50 percent of Florida Future Fund capital is invested in communities with the greatest need. This includes low-income areas and communities of color, both of which have historically been situated in or near precarious environments highly exposed to sea level rise, flooding, and heat waves, among other environmental hazards. By setting strong project criteria for the Florida Future Fund and designating a substantial portion of the funds to communities that most need future-ready infrastructure, state leaders can maximize economic, public health, and quality of life benefits for Floridians. Since different future-ready infrastructure solutions have varying financing challenges, a Florida Future Fund could offer an array of financial services and products matched to overcome the specific deployment barriers of projects, from home energy efficiency improvements to city electric buses. The Florida Future Fund could also provide credit enhancements, rebates, and grants to individuals and municipalities, depending on the type of project and scale. For example, while individuals may use credit enhancements, rebates, and grants to purchase solar home systems, municipalities could also use them to fund neighborhood improvements and flood reduction strategies, including tree canopy expansion or curbside plantings to absorb storm water. Lastly, the fund could require municipalities to contribute at least 20 percent in matching funds to support projects, with arrangements to reduce the match for more economically disadvantaged areas. By using a mix of the financing options described above, the Florida Future Fund could increase access to clean, affordable energy and transportation options; build communities and infrastructure that can withstand extreme weather and other threats; and improve economic security and quality of life for Floridians. The Florida Future Fund could also provide toolkits and guidance on designing equitable projects that meet and prioritize community needs, such as those used by planners in King County, Washington, or the toolkits developed by the equity research institute PolicyLink.108 These equity toolkits act as checklists and step-by-step guides for planners to promote meaningful inclusivity. Furthermore, they ensure that residents receive the benefits of projects by not displacing them from their communities due to rising costs of housing, child care, or other services. To support strong community engagement and remove barriers to participation, project developers should hold public meetings in community gathering spaces at times when the most community members are available to meet. Project developers should provide food, transportation, child care, and translators to ensure maximum participation from community members who live paycheck to paycheck, do not have personal transportation, have young children, or do not speak English. By establishing a strong public engagement process, the Florida Future Fund can ensure that projects are thoughtfully designed and deliver clear community benefits. With the cost of living increasing across the state and the majority of Floridians living without emergency savings, projects supported by the Florida Future Fund would expand economic opportunities for all Floridians and help people keep more of their hard-earned money in their wallets. By creating a Florida Future Fund to support new, long-term, and 21st century infrastructure solutions, state leaders will improve the lives of every Floridian in ways that count: protecting public health and safety, communities, and businesses from future threats. Cathleen Kelly is a senior fellow for Energy and Environment at the Center for American Progress. Miranda Peterson is a research associate for Energy and Environment at the Center. Guillermo Ortiz is a research assistant for Energy and Environment at the Center. Yoca Arditi-Rocha is the executive director of the CLEO Institute. The authors would like to thank the following experts for their contributions to this report: Alison Cassady, Kevin DeGood, Luke Bassett, Ryan Richards, Mary Ellen Kustin, Rejane Frederick, Shiva Polefka, Emily Haynes, Steve Bonitatibus, and Keenan Alexander from the Center for American Progress; Caroline Lewis from the CLEO Institute; Maribel Balbin from the CLEO Institute’s Expert Advisory Council; Susan Glickman from the Southern Alliance for Clean Energy; Zelalem Adefris and Mayra Cruz from Catalyst Miami; former Mayor of Pinecrest, Florida, Cindy Lerner; Alec Bogdanoff from Brizaga; Alex Kragie from the Coalition for Green Capital; Kim Ross from Rethink Energy Florida; Aliki Moncrief from Florida Conservation Voters; and Lauren Ordway from the Institute for Sustainable Communities.